Lines on palm begin to form about four weeks after conception. By the end of the fourth month the formation of lines, ridges and creases on the fi ngers and palms is complete, and this structure remains the same for the rest of the person's life making hands like a fossil record of our life in the uterus. According to medical science the major lines on hands are formed within 2.5 to 3 months of period after conception. The process of formation of minute lines gets completed by 6 months. As per medical science the comprehensive knowledge of palmistry remains hidden in 21st chromosome which means that the development of our lines is completely based on genetics. According to a research in medical science some kind of irregularity in 21st chromosome can cause mental in stability in children and it is observed that their heart line and head line merge into one. This type of child can be eccentric because according to medical science this is a symptom of fatal alcohol syndrome and genetic abnormalities. According to medical science Head Line and Heart Line join when in the fi rst few weeks of pregnancy the mother of child goes through some kind of mental stress or tension. It also proves that state of mind of mother can bring changes in the lines of hands of her child. This is true because genetic fact creates the lines whereas the mother's condition during pregnancy and the upbringing of child can change the health and future of the child. As per the science of palmistry various areas of hand activate specifi c areas of brain and accordingly they are associated with various planets. For example the area below index fi nger is known as mount of Jupiter as this point of hand is directly connected with the knowledge area of our brain. The area below middle fi nger is mount of Saturn because it is related with action area of a brain. The little fi nger is connected with that area of our brain which remains involved in scientifi c calculations, therefore the area below this fi nger is known as mount of Mercury. Two nerves are connected to ring fi nger whereas the other fi ngers are controlled by one nerve only. The larger area of our brain is controlled by this area only and therefore ring fi nger is most important among all fi ngers and that is why it is rightly termed as fi nger of Sun. Probably for this reason only, most of the gems are worn in this fi nger. The other important activities like pooja ceremonies, counting the beads of rosary for recitation of mantras or putting mark on forehead etc. are performed with this fi nger only. One of the most fascinating things discovered about hands is the ratio between the second and fourth digit and its link to levels of testosterone and astrogen. This has become known as the "Digit Ratio" or "2D : 4D ratio", and is obtained when the length of the second (index/ 2D) fi nger is measured, and divided by the length of the fourth (ring/4D) fi nger. This ratio has been found to be one of the only sexually dimorphic (different norms for men and women) characteristics that are fi xed before puberty. Men tend to have longer fourth (ring) fi ngers compared to their index fi nger, while women have longer index fi ngers comparatively. Simplifi ed, the fourth fi ngers length is positively correlated to testosterone, while the second (index) fi nger with astrogen. In Europeans 2D:4D ranges between 1.0 and 0.96, with females tending towards the higher values and males tending towards the lower. Conclusion: Males with a lower 2D:4D ratios (greater fetal exposure to testosterone) have been correlated with being more fertile, more aggressive, and having higher music & sports aptitude. Men with higher 2D : 4D ratios have been found to be more at risk for heart disease. Male to female transsexuals were found to have a higher digit ratio than control males, but one that was comparable to control females. Lower digit ratios in women have been correlated (but not statistically signifi cant) with lesbian/bisexual tendencies, along with aggressiveness and assertiveness. Women with higher digit ratios are more at risk for breast cancer, and more fertile. Schizophrenic men and women were found to have higher digit ratios and a lower 2D:4D ratio has also been found more often in those with Autism. Colour of Hands: Beyond digit ratio, there are other medical clues we can gather from our hands. The colour and appearance of our hands can often be a good indicator of our general health: Poor blood circulation (a symptom for a variety of ailments) can cause hands to take on a blue-ish hue. Red hands may indicate cirrhosis of the liver. Fingernails: Diabetes is often accompanied with "Terry's nails" (half white, half pink nails). Blue fi ngernails can be sign of heavy metal poisoning, (very) poor circulation, lung or heart problems. Yellow or green fi nger nails can indicate a respiratory problem. Clubbing (nails curve over the fi ngertips) is often caused by low oxygen levels in the blood, and could be a sign of lung, liver or bowel disease. Spoon nails (concave shaped) may indicate an iron defi ciency. Fingerprints: Dermatoglyphics is the scientifi c study of fi ngerprints, and rare dermatoglyphic patterns often relate to genetic disorders. In one study patients with Alzheimer's showed a signifi cantly increased frequency of ulnar loops on their fi ngertips. A pattern of eight or more ulnar loops was found signifi cantly more often in patients with Alzheimer's (72%) than in the control group (26%). Certain swirl patterns are known to be associated with genetic disorders such as Downs syndrome. In this way our palm denotes our development and future after conception by mother. 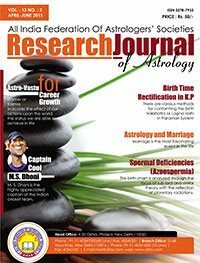 In this Marriage and Matching Issue of Research journal of Astrology articles like Astrology and Marriage, Results of Seventh Lord, Ten point Matching etc. have been included. In addition to that there are other informative articles like Birth Time Rectification in K.P., Significance of Astro-vastu for Rise in Career, Prosperity and Glory from Twelfth House, Numerological Analysis of Captain Cool Dhoni and The Method of Calculation of birth time, date, month and year from birth chart are very interesting. Apart from all these articles editorial by the name Scientific Formation of Hand is very interesting.